Asus ZenFone Max Plus (M1) was and still is marketed as “The Battery King” by Asus. One reason for this is that the battery is huge at 4130 mAh and the other other is claimed standby time “up to 26 days”. Asus is even marketing to use the ZenFone M1 to reverse charge other phones when they run out of power. However, the users that actually use ZenFone Max Plus did not have this experience (myself included). In the official forum there is heaps of reports that the battery doesn’t last through the day or it even gets empty in 10 hours. My experience was around 17 hours daily which left me with a shutting down phone in the evening. Obviously not The battery king Asus would want us to believe. The reply on the forums was to “update the firmware” and they messaged us to send them debug reports. However, not much has changed performance-wise. The battery life was still sad and could be labelled as “The Battery Beggar”. Until a few days ago, when Asus released firmware 14.02.1805.61. There is no mention of a battery fix in the release notes (usually it was mention), but the battery lasts notably longer. If previously I have got somewhere between 16-18 hours out of it, I’m getting over 20 hours now (21-26 hours). The first day I went to bed with 44% battery available and I didn’t have to charge the phone until the next day in the afternoon. 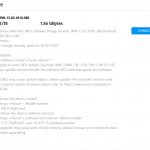 If you have Asus ZenFone Max Plus (M1) and are experiencing battery problems and battery drain I warmly suggest you update to firmware 14.02.1805.61 as soon as possible. Not only it improves the battery by large, it also includes the Android security patches that were missing in previous firmwares. Here’s a screen grab from my phone after the upgrade (in Slovenian). 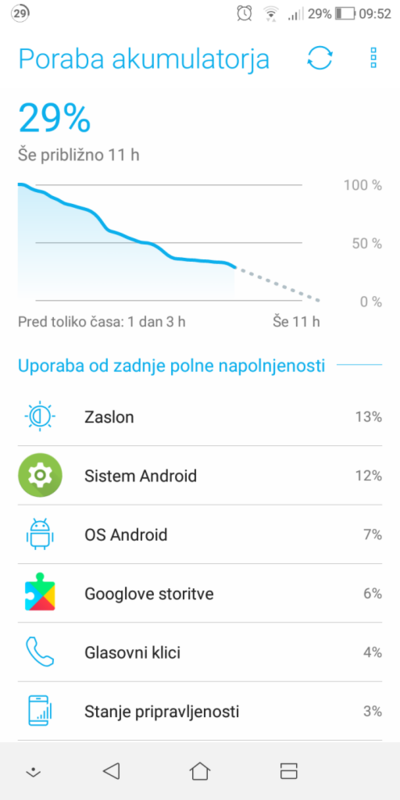 Battery level was still at 29% and I haven’t charged it for 1 day and 3 hours. Before the upgrade this would be impossible. The projected battery left was 11 hours – this was in the morning and in fact I didn’t charge the battery until the afternoon.